CD 1: ; 1. The Humors Of The Whiskey; 2. Rose In The Garden; 3. Keel Row; 4. Saddle The Pony; 5. The Wind That Shakes The Barley; 6. The Mill Stone Grinder; 7. Paddy On The Turnpike; 8. The Blackthorn Stick (Take 1); 9. The Blackthorn Stick (Take 2); 10. Harvest Home / Galway Bay; 11. The Scholar; 12. Gurren’s Castle / Money Musk; 13. The Heath’ry Breeze; 14. Hennessy’s Hornpipe; 15. Paddy O’Rafferty’s Jig; 16. Gordon’s Reel; 17. Happy To Meet And Sorry To Part; 18. Stack Of Barley (Gennett); 19. McBan’s Reel; 20. Stack Of Barley (Okeh); 21. Cameronian Reel; 22. Kitty’s Ramble; 23. Irishman’s Blackthorn. CD 2: ; 1. Barn Dance; 2. The Irish Washerwoman; 3. Sheeren’s Reel; 4. Shannon Bells; 5. Baxter’s Jig; 6. The Ways To The Racket; 7. Medley Of Slip Jigs; 8. The Lark In The Morning; 9. Phil The Fluter’s Ball; 10. The Banks Of Ireland / The Ships Are Sailing; 11. The Plains Of Boyle; 12. The Salt Hill Pipes; 13. The Banks Of Newfoundland; 14. The College Grove / The Flaggon Reel; 15. The Lark In The Morning / Clancy’s Jig; 16. The Flax In Bloom / The Bag Of Potatoes; 17. The Broken Pledge / Kitty In The Lane; 18. The Tuam Reel / The Salamanca Reel; 19. The Irish Girl / Green Fields Of America; 20. Manning’s Jig / The Country Jig; 21. The Tap Room / The Moving Bogs; 22. Old Man Dillon / The Rose In The Heather; 23. The Fiddler’s Delight; 24. Contentment Is Wealth. It's a hundred years since Peter Conlon arrived in New York and ninety five since his first recordings were released, yet there seems to be more myth than substance surrounding the man and his music. Prior to this release less than a dozen sides of the fifty that he recorded have been in any way available, some only through very rough copies of scratchy original 78s. This collections sets out to correct that situation and it presents 47 of the known recordings of Conlon. Only four tracks are missing. Two sides on the Gaelic label from 1921 haven't been tracked down and the quality of two other sides were considered too poor to include. Oldtime Records have already issued three well documented and well researched collections of previously unobtainable 78s, the last release focusing on pipers and this collection shows the same attention to detail. Over 10 years in the making, this is a real labour of love which will stand alongside collections of the music of Coleman and Morrison as part of the definitive history of Irish American music recordings in the first half of the 20th century. Presented in chronological order and using the tune titles given on the original recordings, this two CD set starts with the six sides recorded for Columbia in November and December 1917. Even in this first half dozen sides there's obviously something remarkable about the personality and verve in Conlon's playing. It was only a couple of years since 78s of three minutes duration became the norm so these early recordings are all of one tune played over for the full three minutes. Even in his first session Conlon seems to have understood the recording process and is able to finish some of these tunes with a flourish rather than the hasty wind up that so many 78s seem to entail. The focus on a single tune allows Conlon to explore the tunes and we get a view of his creativity in a way that is similar to the recordings of Johnny Doran made by the Folklore Commission thirty years later in Dublin. The Keel Row is transformed from a simple, almost hackneyed, piece into a virtuoso display of punched out rhythm and cascading triplets. The Wind that Shakes the Barley alternates smooth rolls with staccato passages. In most of the selections there are also melodic variations in the tunes to keep even today's worldly-wise listener hooked waiting for the next twist in the tune. Other common and well known tunes like the Harvest Home and The Irish Washerwoman sit alongside rare tunes such as Sheeren's Reel. The accordion and accordion playing was still in its infancy at this stage and Conlon plays a single row box, but this is no mere melodeon playing as you might find today in parts of Kerry or Connemara, it is an intricate and well developed style involving double stopping, rolls and triplets to provide variety as well as short, almost staccato notes to help drive the music along. Single row instruments tend to force the music into a single key, in this case D major or B minor, but Conlon shifts some tunes to get the right minor feel to the tune. Others he happily plays in the major keys with small melodic variations to avoid having to play the C#, while in others again he makes a feature of using the C# in place of the modern C natural. In this way he imitates the practice of Patsy Touhy, and presumably other pipers, who never used the C natural in their music. The music is fast but so well controlled that the speed is not immediately obvious. The music sounds like it is played for dancers. 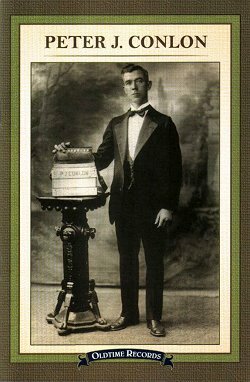 The second CD takes the music from late 1921 to the end of Conlon's recording career in 1929. After 1924, most of the selections are pairs of tunes and include a few duets, firstly with flute player Tom Morrison and later with James Morrison the fiddle player. Copies of the duets with the flute previously in circulation were almost unlistenable because the flute was about a semitone sharp to the accordion. Gerry Clarke who has carried out the transfer from the 78s has done a great job in reducing the volume of the flute to bring out Conlon's playing on these sides. The two sides with James Morrison are well known from other collections. CD 2 also highlights a remarkable coincidence in changes in accordion production and improvements in recording methods. The Columbia recordings from 1928 and 1929 were made using the new electrical recording technique. 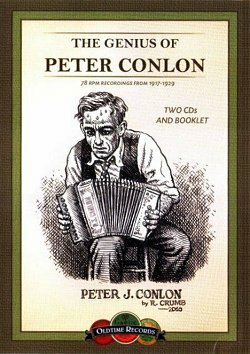 Around this same time Conlon had started paying a Baldoni Bartoli accordion made in America and featuring eight reeds for each note producing a louder and rich toned accordion and these sides sound as fresh today as when they were made. These last dozen recordings truly deserve the epithet genius, they are breathtaking in the richness of tone and the vibrancy and variety in the playing. Sadly this was the last we will hear of Conlon's playing. The Great Depression brought an end to PJ Conlon's recording career although he managed to keep playing mostly in public houses or for private parties. No doubt times were very hard through the thirties and forties and when his daughter died in 1951 he stopped playing altogether. Conlon ended his days in a nursing home and died almost forgotten in 1967 aged about 75. The CDs are presented in a DVD case with a booklet giving a richly illustrated biography, discography and essays on repertoire and the history of the accordion in America. It is a fascinating glimpse into the world of Irish American music over 80 years ago, much of it based on research and first hand interviews with family and contemporaries of Conlon, some of these now gone, conducted by Alan Morrisroe and contemporary accordion genius Charlie Harris. The significance of this collection is reinforced by the cover which has been provided by the cartoonist and 78s enthusiast Robert Crumb showing Conlon as he had been described by Jack Doyle in the late '40s: "putting everything and more into his music." For many people this collection will present the first real opportunity to hear PJ Conlon, particularly playing solo and it is an opportunity not to be missed. Available through Claddagh Records and Custy's, this is a recording that every Irish music enthusiast will enjoy.